NASA is convening an Engineering Review Board meeting at 4:30 p.m. EDT to discuss the status of space shuttle Atlantis and the launch pad following a lightning strike earlier today. 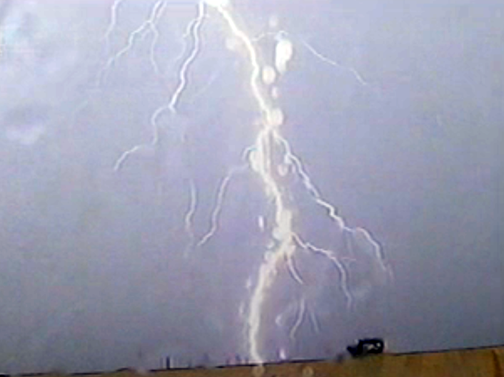 Lightning was detected within a third of a mile of the pad. 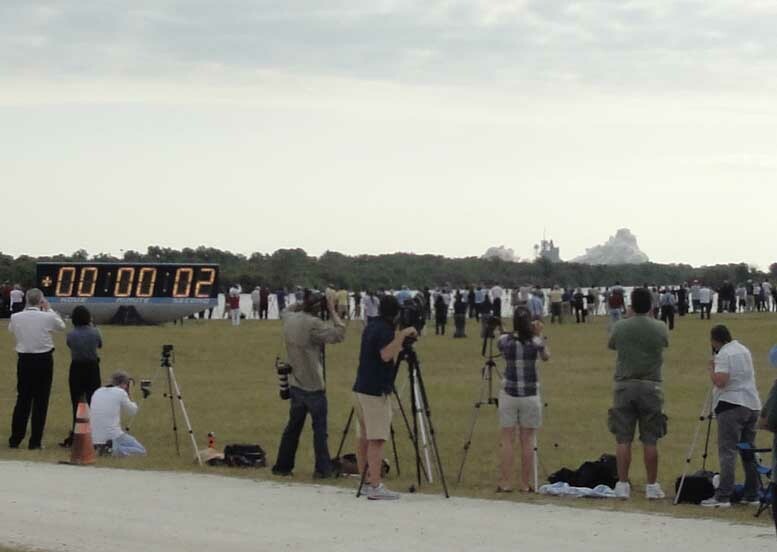 Dawn, Wednesday, May 18, 2011, Kennedy Space Center. 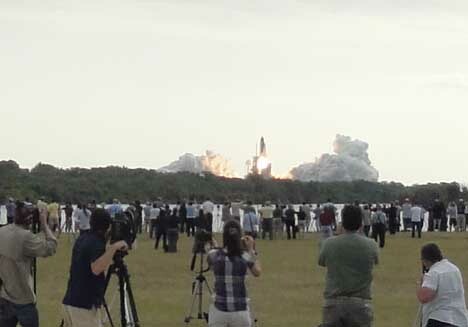 In the distance is Pad 39A where the Endeavour was launched nearly two days previously and in the foreground is the press site. The shot was taken by Carol Anne Swagler. Shuttle Endeavour on Pad 39-A early evening, Sunday, May 15, 2011, 6:20 pm. This view is from the press site. Earlier in the day, shortly after Noon, the RSS was rolled back. Now all that remains is a decision expected to be made about 11 pm whether to begin fueling. 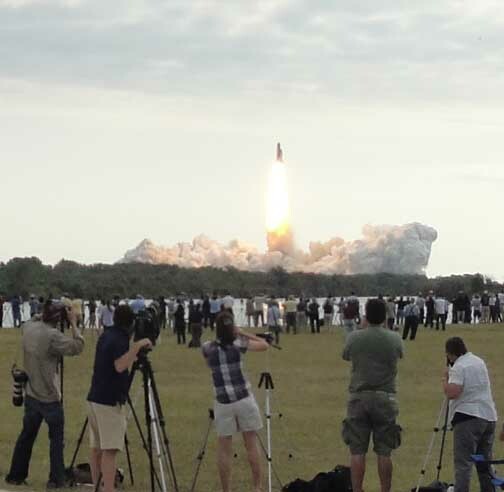 The Astronauts will head for the pad shortly after 5 am, and Endeavour will lift off from Kennedy Space Center at 8:56 am, Monday, May 16, 2011, if all continues to go as planned. photo © 2011 by / Peter M. Crow for Seine/Harbour® Productions, LLC, Studio City, California. 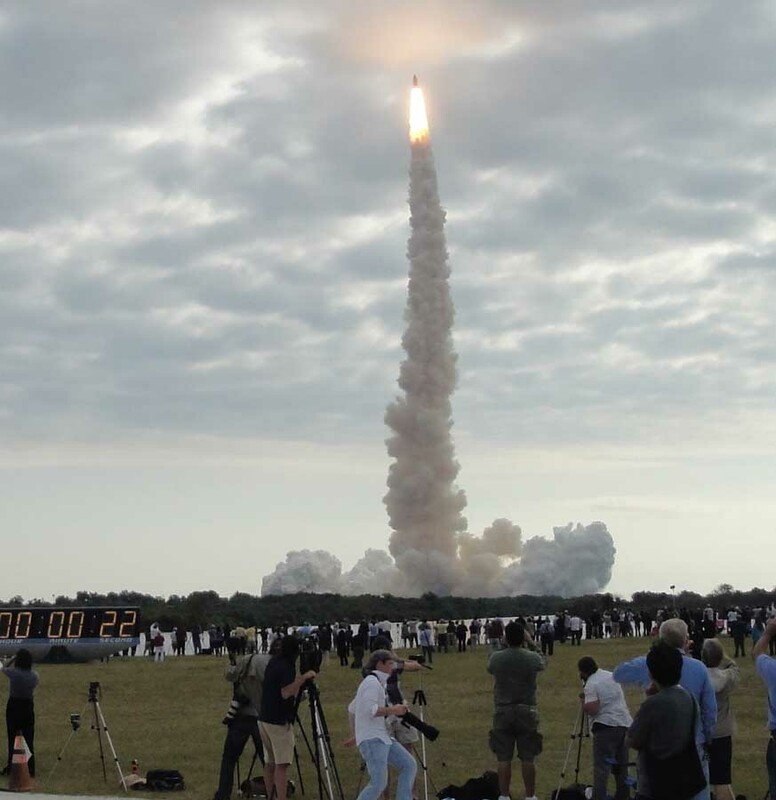 NASA offered the press different opportunities on the shuttle missions, including walking the Crawler and Shuttle from the Vehicle Assembly Building to the Launch pad. 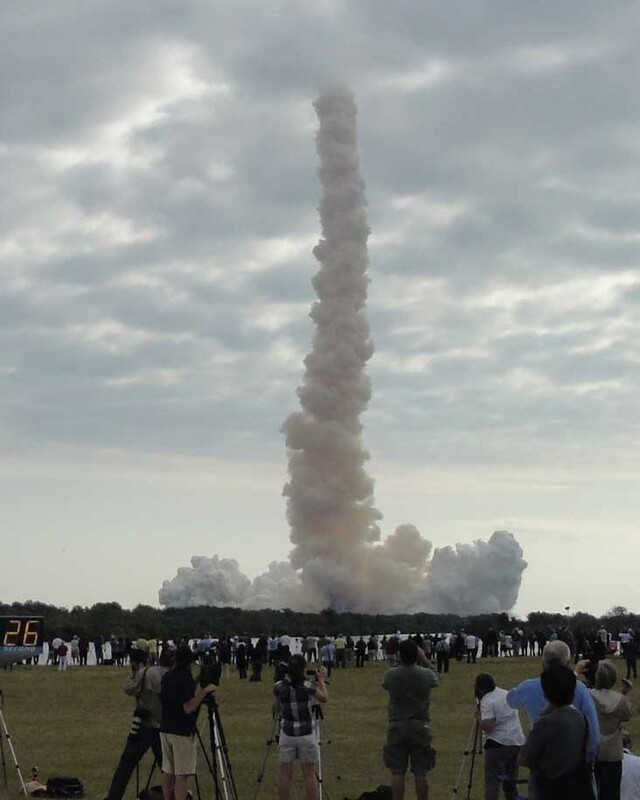 It’s a long walk and in February 2007, it was a cold one that took over six hours and ended at Pad 39B. The shuttle on the Crawler was Atlantis. Carol Anne Swagler stands on one of the two pebble covered tracks which serve as the Crawler's highway to the two launch pads. Ms. Swagler, a veteran newspaper woman, was working as a photographer for an Oklahoma newsapaper, The Grove Sun Daily. 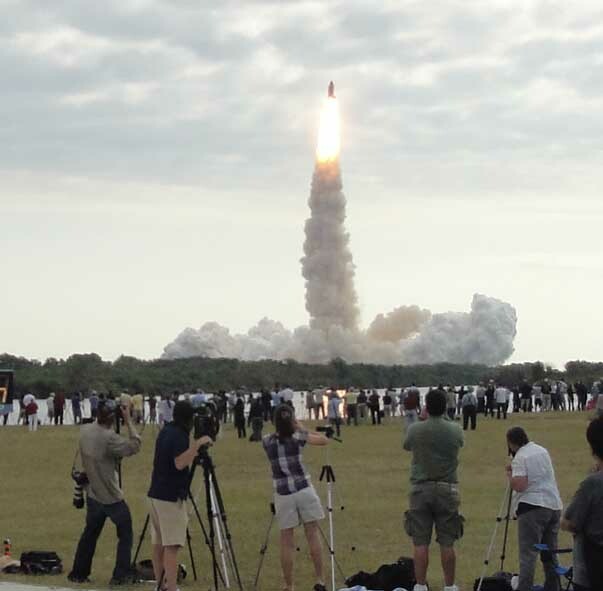 In the waning days of the shuttle program, Ms. Swagler was frequently accredited to photograph the shuttle and other NASA launches at the Cape. The Grove Sun Daily, unusual for a small daily, sent reporters and photographers to cover the space program frequently, all the way back to the Apollo 17 moon launch in 1972; its community had a NASA sub-contractor. 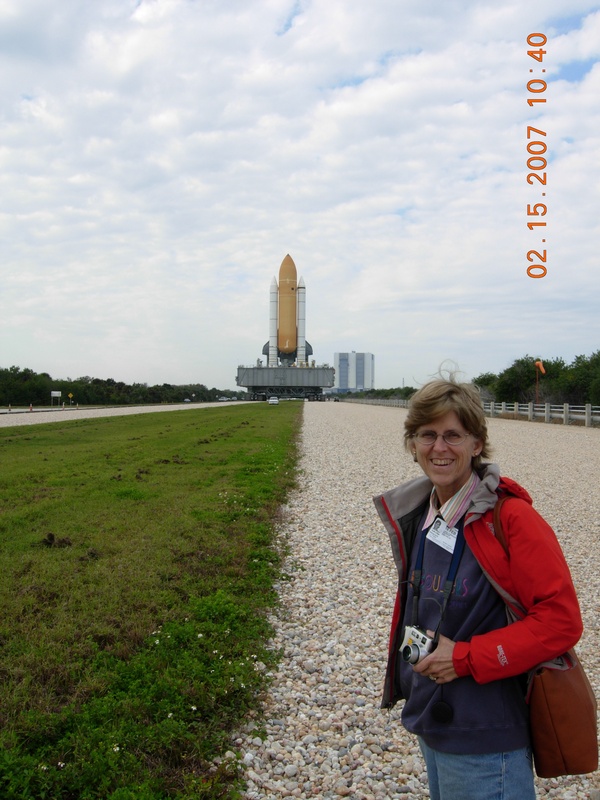 In the background over Ms. Swagler's shoulder is the Vehicle Assembly Building. The Crawler and shuttle are heading toward Ms. Swagler -- she had walked on ahead. If she had not moved -- which she did -- the Crawler would have flattened her and there would have been no more trips to the Cape for Ms. Swagler.